Winter won't quit. We've come across more than a few dramatic visuals and oddball stories amid the extreme cold, from frozen ice runways, to slushy waves, to an oddball story about a man and his "Loo-cy" toilet plow. And did you see the ice statue that looks just heavenly? The site of the 1980 Winter Olympics at Lake Placid offers the public the rare chance to try skeleton sledding. You can pay to ride belly-down, head first on a sled the size of a throw rug. If you feel like riding belly-down, head first on a sled the size of a throw rug, go to Lake Placid, New York. 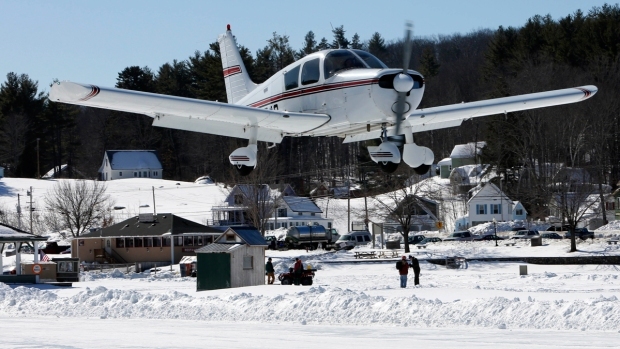 Planes are landing on the only approved ice runway in the lower 48 states, on New Hampshire's Lake Winnipesaukee. 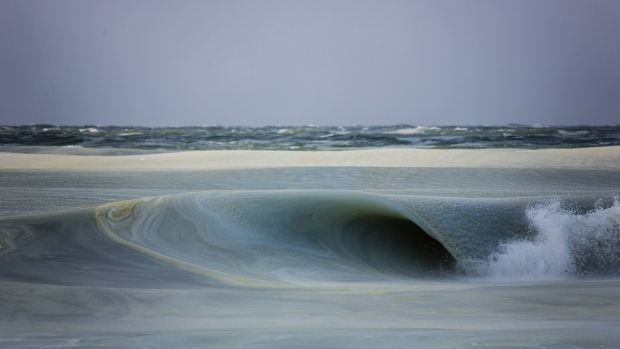 Surf's up in Nantucket, where low temperatures gave the water the consistency of a 7-11 Slurpee. 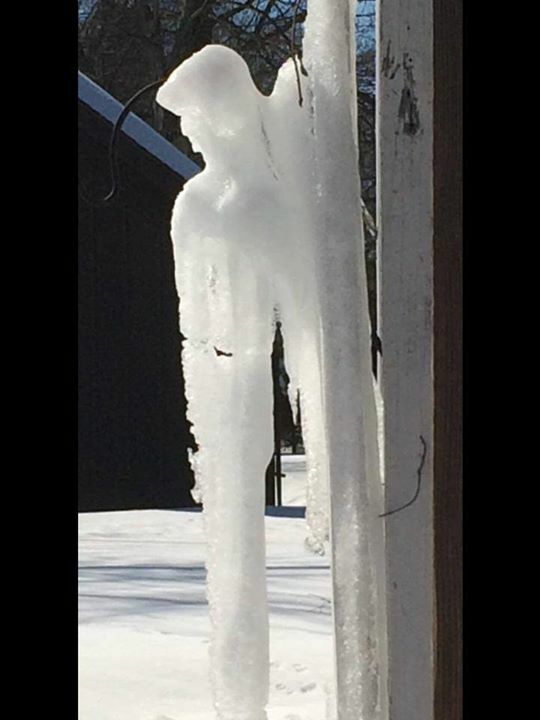 Audrey Totire sent this photograph of an ice formation in Bristol to NBC Connecticut after her friends noticed the image looked like an ice angel. What do you see in this icicle? 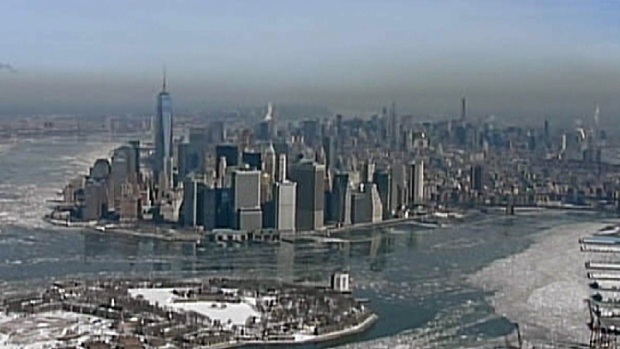 NBC 4 New York shot this chopper video of ice floating on the Hudson River in New York City. 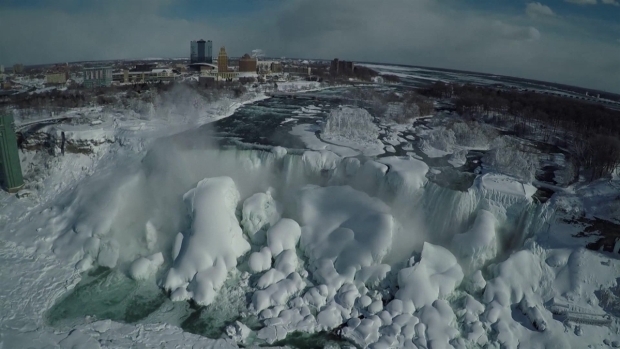 Stunning aerial video of the frozen Niagara Falls as the Siberian Express plunges much of the country into a deep freeze. A drone over Niagara Falls captured this stunning view of the iced over landmark. 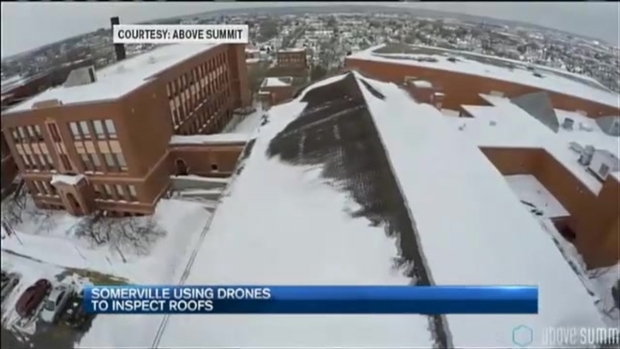 One Massachusetts town has a new tool in its fight against the risk of snow-covered roof collapses: drones. One Massachusetts town, Somerville, hired a company to shoot video from drones high above the city. The footage will be used to help clear snow from roofs that could be in danger of collapsing. A man outside Washington, D.C., attached a plow to a motorized toilet he built to clear snow at his business Wednesday. He calls the the contraption "Loo-cy," and it's equipped with a toilet paper stand and a magazine rack. 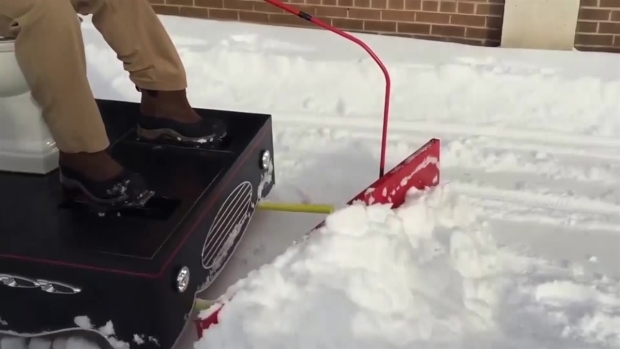 In Rockville, Maryland, a man attached a plow to a motorized toilet to help clear snow. 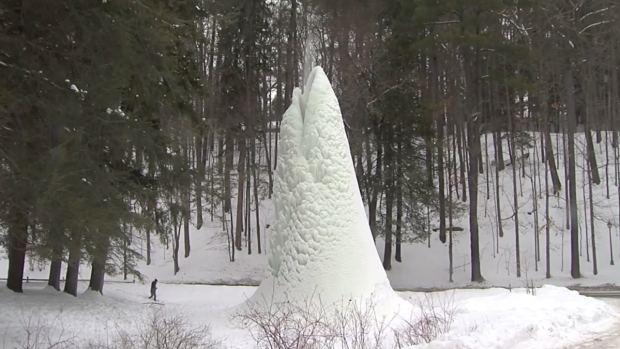 Cold temperatures have transformed a geyser in western New York into an "ice volcano." One of the most dramatic visuals from the storm has been a geyser at Letchworth State Park in upstate New York that froze over. It became a five-story tall "ice volcano." 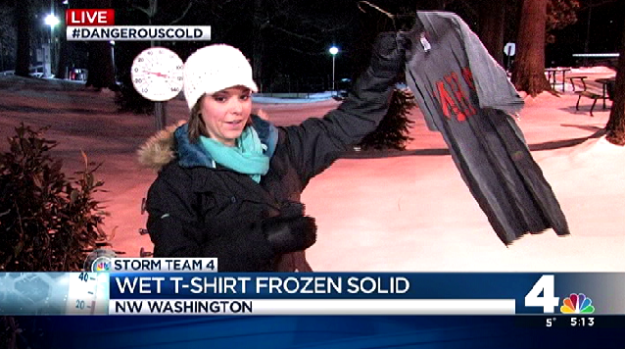 Storm Team4 meteorologist Amelia Segal found out just how cold it was when she took a wet t-shirt outside. How long would you guess it took to freeze a T-shirt in freezing temperatures? In Frederick, Maryland, Bradley Stelzer made a time-lapse video of a 12-inch-tall wine bottle getting covered by snow. He shot the video with his iPad Air between 9 a.m. and 8 p.m. on Feb. 21. How about an oversized bucket instead of a sled? They are definitely resourceful! Last year the dogs even got a turn with the kids! This is Miranda and her daddy. 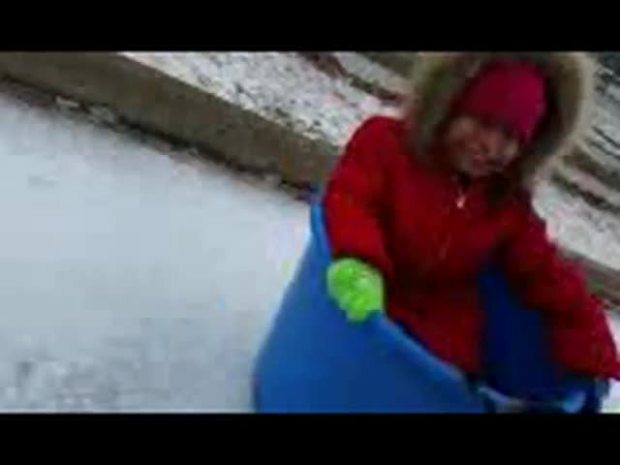 If you don't have a sled, sometimes, a bucket will do in Texas. 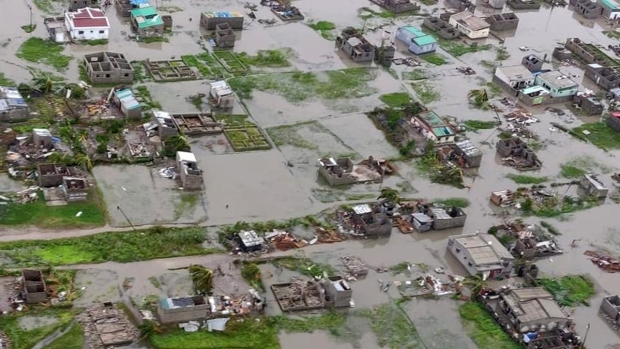 Here's a look at other dramatic images of extreme weather since the year began.